A football club manager has been given a suspended jail sentence after admitting helping the club cheat the taxman out of £250,000. The money was used to buy players and eventually gain promotion to the Football League. So who said cheats never prosper? 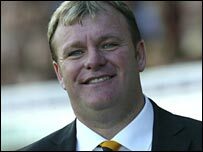 Boston United's Steve Evans has narrowly avoided becoming the first Football League manager to be sent to jail. Evans and his former chairman, Pat Malkinson, pleaded guilty to conspiring to cheat the public revenue between 1997 and 2002. They were both sentenced to prison sentences, suspended for two years - Evans' was 12 months and Malkinson's 24 months. 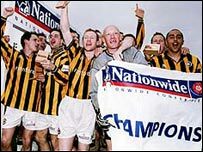 The Lincolnshire club's cheating was so successful that they gained promotion to the Football League in 2002 with a squad of players of whom many were being paid inflated wages written into secret contracts. Boston pipped Dagenham and Redbridge on goal difference but although the Football Association docked them four league points they decided to hold it over into the next season, hence promotion was unaffected. The injustice still rankles with Dagenham, who have talked of suing the FA for negligence. Two other men - Ian Lee, the ex-club accountant and Brian James, formerly the payroll manager - were acquitted after a trial at Southwark Crown Court. A third man, former general manager John Blackwell, was acquitted on the judge's directions. The jury heard the club operated a shadowy system of parallel contracts and secret payments which enabled them to recruit the best players which they otherwise would not have been able to afford. Star striker Ken Charlery told the trial he was given one contract which promised him £620 a week plus a £16,000 signing-on fee. Neither the Football League nor the Inland Revenue was ever shown this contract. They were shown a bogus contract which purported to pay Mr Charlery only £120 a week and failed to mention the signing-on fee. 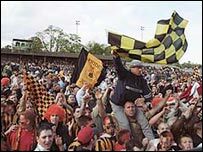 News of the irregularities emerged shortly after Boston won promotion and the FA punished Boston by fining them £100,000 and docking them four league points. Evans was suspended for 20 months but later returned to manage Boston. Dagenham and Redbridge were runners up to Boston that year and have always claimed they were wrongfully deprived of a place in the league. Dagenham spokesman Dave Simpson told the BBC News website: "We lost out. We lost four years of Football League TV money, which is about £400,000 a year, not to mention the extra income from higher attendances and entry into the FA Cup and League Cup at an earlier stage." But he said that, because Boston had been punished already by the FA, it was unlikely they would face further punishment and would therefore keep their place in the league. A judge at Southwark Crown Court on Friday also ordered Malkinson to pay back £349,000, which amounts to £250,000 plus interest. In mitigation Jim Sturman QC said there was "absolutely no risk of Evans reoffending as he is terrified of the prospect of even a day in prison". Mr Sturman said Evans was a very different man to the "bombastic character" who managed the club between 1998 and 2002. He pointed out there was no personal gain from the fraud and, quoting from Jimmy Greaves' book The Heart Of The Game, he said: "No-one goes into non-league football for the money. They go in for the love of the game." Graham Ranson of HM Revenue and Customs said: "The law says tax and national insurance must be deducted from employees' wages and the moneys passed to HMRC. "In this case, wages were paid but disguised as expenses and by their actions Malkinson and Evans not only committed fraud but also achieved for Boston United an unfair advantage over other clubs who operated within the law." This case should act as a deterrent to anyone considering tax fraud, he added. A Football Association spokesman said Boston had already been punished once - with the fine and points docked - and it was not planning to revisit the matter. Dagenham's chairman, Dave Andrews, said his club would be seeking legal advice but he added: "I can't really see where we can go with this as they have already been punished once." Evans and Boston are currently mired in a relegation dogfight while Dagenham are hoping to get promoted. "Wouldn't it be poetic justice if we swapped places this season?" said Mr Andrews.